All of this is in the effort of ensuring that any money flowing in and out of your business is properly accounted for. Ultimately, you’ll use this information as the basis for making many financial and organizational plans: calculating your revenues, paying taxes, borrowing loans, and more. Therefore, with bad bookkeeping practices, your small business could be in big trouble with the IRS or when looking for financing from banks. Asides from implementing good record keeping practices, there are also general accounting errors that you should be aware of. We have mentioned that one of the leading causes of poor record keeping is doing all the accounting work in-house. It is always advisable to hire a professional bookkeeper who has the experience in handling all aspects of the practice for best results. Outsourcing your bookkeeping tasks can alleviate a ton of troubles. However, if you go for an inexperienced or newbie bookkeeper for a cheaper fee, expect costly bookkeeping troubles ahead. Keeping inaccurate books can cripple your business down to the very core. You can end up using more on your budget than the business is earning, filing less returns than you are supposed to, and generally losing track of your business profits. No one ever wants the IRS knocking on their business door for an audit. But if your bookkeeping habits are in question—perhaps you are not paying the right amount of tax, you are missing on tax deadlines, or defaulting—you will surely get a visit from the IRS soon. What Are the Consequences of Bad Bookkeeping? 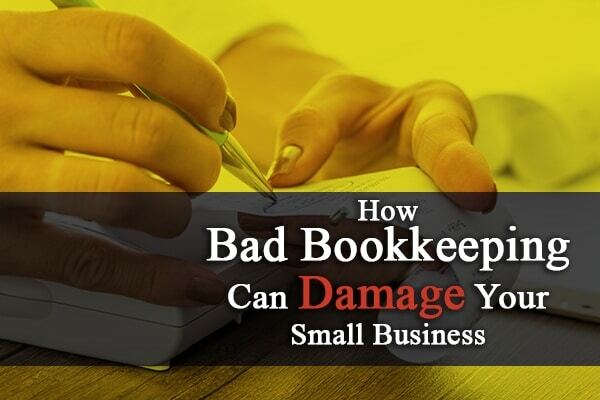 There are many tough consequences of bad bookkeeping. One is that you could lose an audit by the IRS auditors, causing your business to be levied hefty fines that can cripple your operations. Another consequence would be running into cashflow crunches because your business cannot operate effectively if the money flow is not flowing. You could also face losing your small company all together because of poor financial and business planning. Without proper bookkeeping, you simply can’t tell whether your business is growing, stagnant, or expected to close down. However, if all this work is too much for you or you don’t have an in-depth knowledge on how to it perfectly, consult a professional Las Vegas bookkeeper for small businesses to help you out. Professionals understand your businesses bookkeeping needs better and will advise you on how well the business is doing based on the book values. Now that you have read how vital proper bookkeeping is and how if done wrongly can damage your business, it’s time to re-think your current practices before tough times come calling. Remember, a professional bookkeeper can do all the leg work for you while you concentrate on growing your business. Call us at (702) 471-7223 if you want more information on what we offer.